Over his untasteable apology for a cup of coffee, listening to this synopsis of things in general, Stephen stared at nothing in particular. He could hear, of course, all kinds of words changing colour like those crabs about Ringsend in the morning, burrowing quickly into all colours of different sorts of the same sand where they had a home somewhere beneath or seemed to. After the noncommittal vagueness of “things in general” and “nothing in particular”, I love how the image of local crabs, so suddenly specific, transports us (and Stephen) briefly out of the human domain across to the Dublin coast and the wordless creatures alive in the sand. It’s a strange and surprising analogy and one with a hint of synaesthesia. 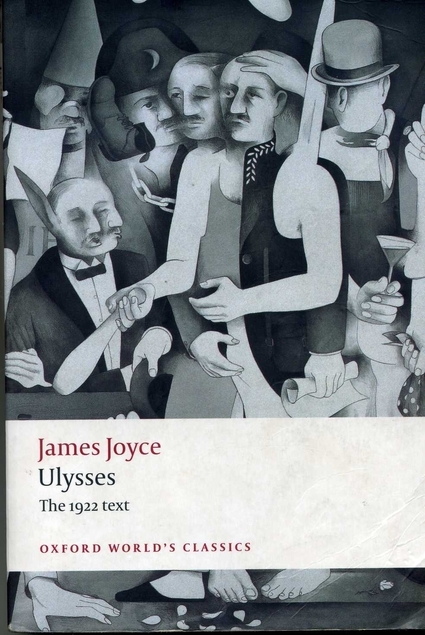 On Bloomsday last year I wrote about Finnegans Wake, James Joyce’s last and least-read book. This year, being less blessed with free time, I’ll share some lines from Arthur Power’s book Conversations with James Joyce (Barnes & Noble, 1974), which I’ve been thumbing through again. The first excerpt offers a glimpse of domestic life chez Joyce in Paris, where Power and Joyce first met. Joyce, a restless man, was continually changing his abode, partly through circumstances no doubt, but also on account of his nature, and shortly afterwards he moved to a pleasant, airy apartment opposite the Eiffel Tower, where I used to visit him frequently. —For God’s sake, Jim, take that coat off you! But the only answer she got was his Gioconda smile, and he would gaze back humorously at me through his thick glasses. Nora’s line always makes me laugh. On Tumblr I posted a few thoughts from Joyce, courtesy of Arthur Power, on his efforts to convey Dublin through the texture of his words, and his belief in the primacy of emotion in art. Emotion has dictated the course and detail of my book, and in emotional writing one arrives at the unpredictable which can be of more value, since its sources are deeper, than the products of the intellectual method. In the intellectual method you plan everything beforehand. When you arrive at the description, say, of a house you try and remember that house exactly, which after all is journalism. But the emotionally creative writer refashions that house and creates a significant image in the only significant world, the world of our emotions. The more we are tied to fact and try to give a correct impression, the further we are from what is significant. In writing one must create an endlessly changing surface, dictated by the mood and current impulse in contrast to the fixed mood of the classical style. This is ‘Work in Progress’. The important thing is not what we write, but how we write, and in my opinion the modern writer must be an adventurer above all, willing to take every risk, and be prepared to founder in his effort if need be. In other words we must write dangerously: everything is inclined to flux and change nowadays and modern literature, to be valid, must express that flux. . . . A book, in my opinion, should not be planned out beforehand, but as one writes it will form itself, subject, as I say, to the constant emotional promptings of one’s personality. Conversations with James Joyce is a short (111 pp. ), appealing read, with enough contextual detail to enliven Power’s reports but with the pair’s ideas, dialogues and debates very much to the fore. Joyce expounds on his influences, reviews his own work, and muses on his tastes and preferences in literary and other matters. I must add, as the prospectus implies an invitation to purchase, that I am an elderly Irish gentleman, and that if you imagine that any Irishman, much less an elderly one, would pay 150 francs for a book, you little know my countrymen. if you imagine that the elderly Irish gentleman who wrote it (the letter not the book) has not subscribed anonymously for a copy of the revolting record through a bookseller you little know my countrymen. Pound was far from satisfied, though, and exchanged about a dozen letters with Shaw on the matter. In March 1921 he grumbled to H. L. Mencken: “Shaw now writes to me twice a week complaining of the high price of Ulysses.” The correspondence ended with Shaw quipping: “I take care of the pence because the Pounds won’t take care of themselves” (also reported as: “I take care of the pence and let the Pounds take care of themselves”). 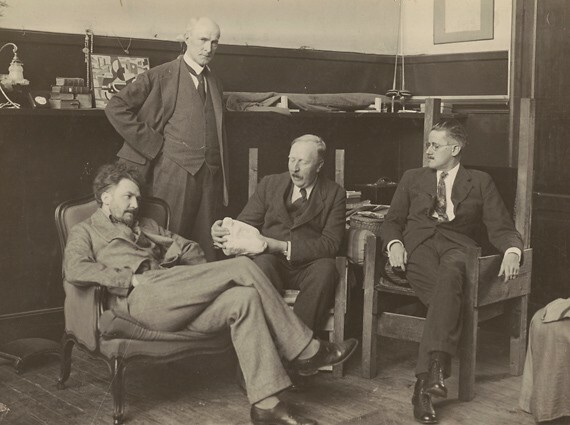 L–R: Ezra Pound, John Quinn, Ford Madox Ford, and James Joyce. In Pound's rooms in Paris, 1923. Photograph from Cornell University. Last year I said I had never taken part in Bloomsday — not in any official events anyway. This year is no different, but like Leopold Bloom I’ll be walking around taking in the sights, sounds, and smells of the city (Nora’s Galway, not James’s Dublin). I might bring a Joyce-related book. That will do. If you’re on Twitter, you’ll find me making occasional Joyce-related tweets. Which never filled anyone’s purse.